While Patrick was looking for the perfect venue to celebrate his birthday, one of the first places he considered was his favourite restaurant: Miku. Miku's Blue Sky private dining room, with a spectacular view of Burrard Inlet, was a perfect fit for our group of 22. However, Patrick was informed that we had to spend a minimum of $1,600 (just under $80 a person). That didn't work for us for two precise reasons. One, we were students, and two, not all of us were whales. 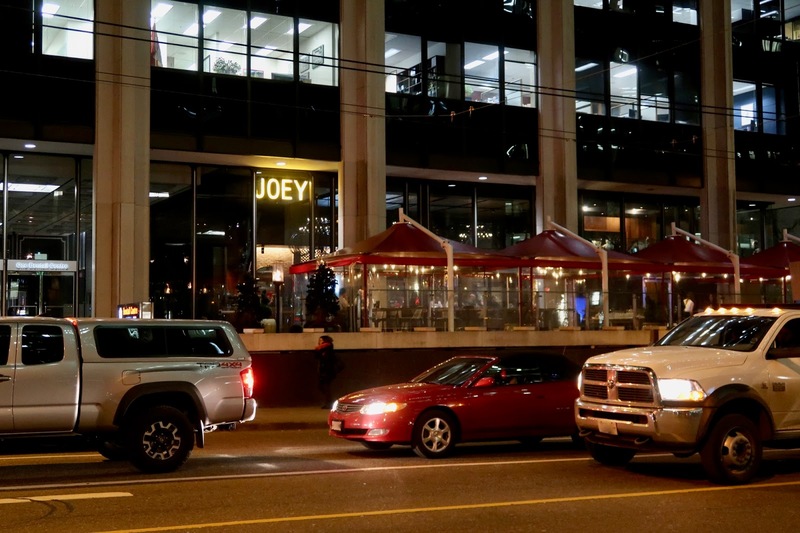 Instead, Patrick let the group choose between Cactus Club and JOEY. 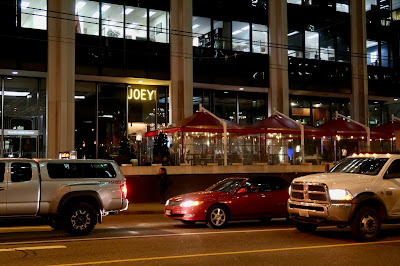 One key difference between the two restaurants is that JOEY serves sushi and Cactus Club doesn't, so I breathed a huge sigh of relief when JOEY got the popular vote. Also, due to my cultural background, if I am not using chopsticks at a restaurant, then it won't feel right to me. 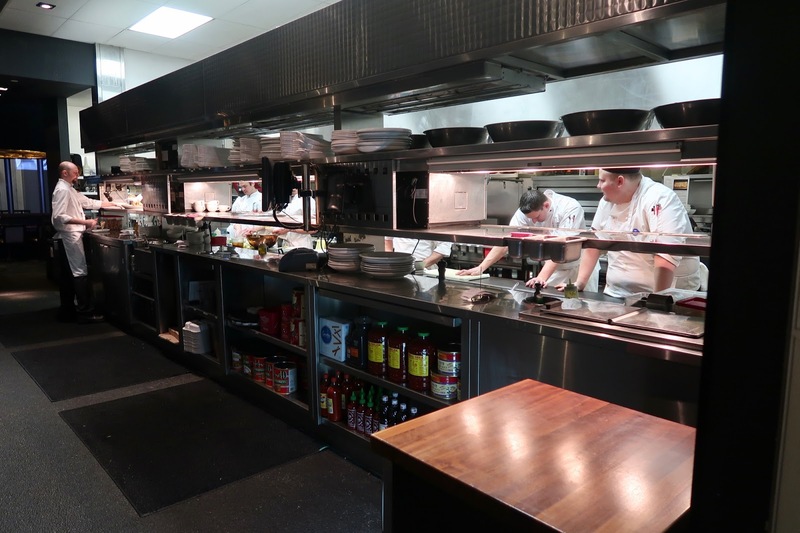 We were here on a Friday night, and everything from the kitchen to the dining areas and entrances was packed. On the one-page menu was a simple assortment of some Western and some East-meets-West appetizers, burgers, and entrées. As JOEY restaurants are designed to be ideal places for fun gatherings, the drinks menu was much more impressive than the food menu. Unfortunately, Patrick banned me from drinking on this adventure because the last time I drank in front of him, my brain completely went to Narnia. To make up for my loss, I gracefully dealt with the situation by ordering three times as much food as anyone else. 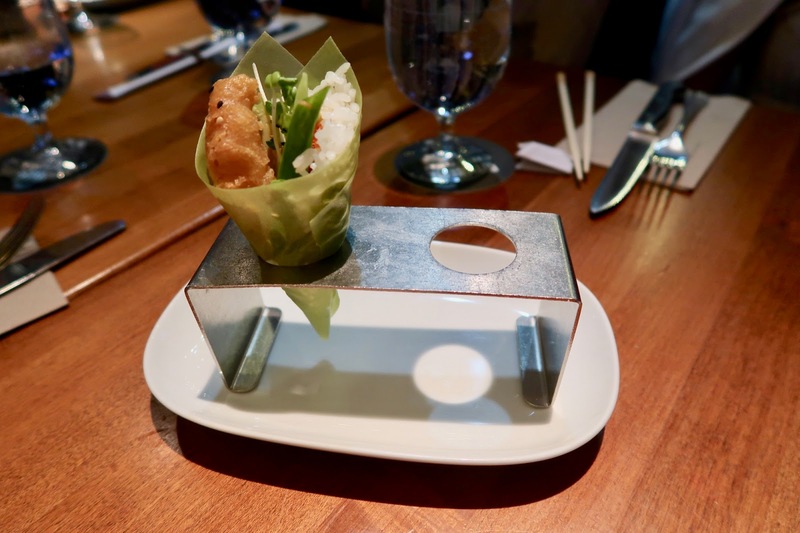 Among the first items to arrive at our table was the Sushi Cone, which consisted of tempura prawn, avocado, spicy mayonnaise, tobiko, and a small amount of daikon. 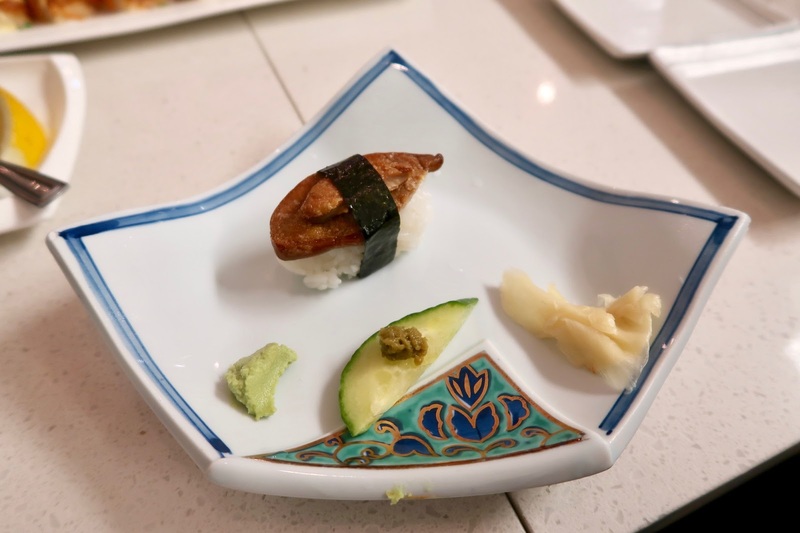 The soy wrapper that held the cone together was very light and barely noticeable texture-wise when eaten. The prawn tempura had a nice crunch, but was a bit on the drier side. As JOEY's main focus is not sushi, I was pleasantly surprised when the Osaka Style Pressed Salmon Oshi ended up being one of the best versions of the popular Aburi Salmon Oshi dish I've ever come across. Topped with thinly sliced serrano peppers, the salmon had a melty, creamy texture and was very rich in flavour. A sprinkle of tempura bits provided some textural contrast to the soft bed of rice underneath. Salmon was also inserted into the rice layer to ensure that both the top and the bottom of each piece of sushi had sufficient flavour. 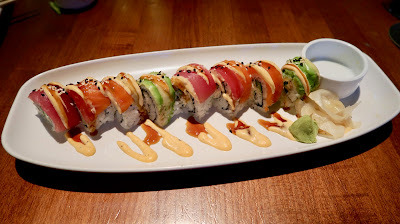 From the category of East-meets-West fusion items, the Rainbow Roll came with ahi tuna, salmon, crab meat, avocado, and Sriracha aioli. The crab meat had a flavour akin to that of a tuna egg salad, and despite the appearance of large amounts of rice, the flavours were actually well-balanced. I also enjoyed the light spiciness provided by the drizzle of spicy mayonnaise on top. 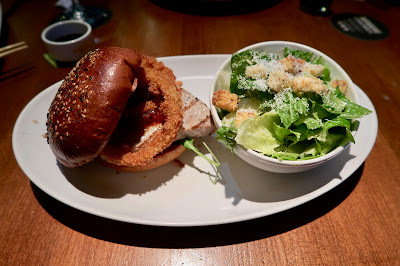 Feeling a little adventurous, but not wanting to stray too far away from my natural habitat, I went for the Ahi Tuna Club, consisting of ahi tuna (grilled rare), bacon, sweet pepper relish, onion rings, and a toasted sesame bun. It also comes with a side of standard-fare Caesar salad. The best part of the burger was undoubtedly the juicy and smoky ahi tuna. However, I found the crispy onion rings rather hard, and they also made it slightly difficult for me to hold the bun together. 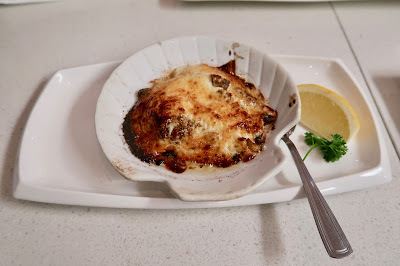 Nonetheless, the ingredients created a nice mix of sweet and savoury flavours, and I enjoyed this dish despite the fact that it was not sushi. Every now and then, I like to motivate my friends to get good grades by offering to treat them to sushi if they do well in their courses. Last semester, I offered to treat Patrick and Sean to Victoria Sushi if they each got at least an A in a course specified by me. I expected this to be reasonably challenging, but little did I know that Patrick would try to obtain that A by studying at least 6 hours virtually every day throughout the semester. He turned down sushi adventures, weekend parties, and even raves that he already had tickets for just to study. I don't think I could have studied that much even if my reward was a two-month trip to Japan. Nonetheless, both Patrick and Sean got their A's, and off we went to Victoria Sushi. 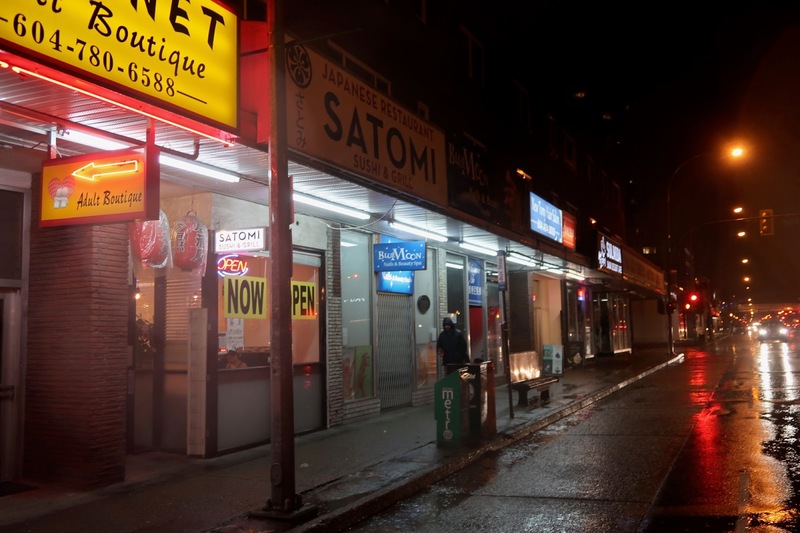 Taking transit to Victoria Sushi is not exactly an easy task. 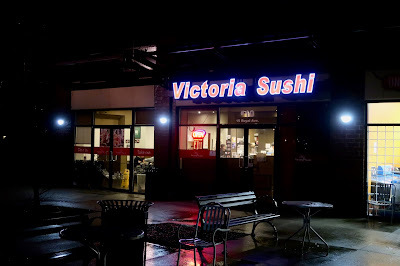 The last time I visited Victoria Sushi, I tried to walk there from Columbia Station and got hopelessly lost. This time, Patrick offered to drive me there instead. However, due to the darkness of the night, we ended up on the wrong lane and were forced to go all the way to Surrey, which caused Patrick to start low-key raging. What should have been a three-minute drive ended up taking us more than 20 minutes. 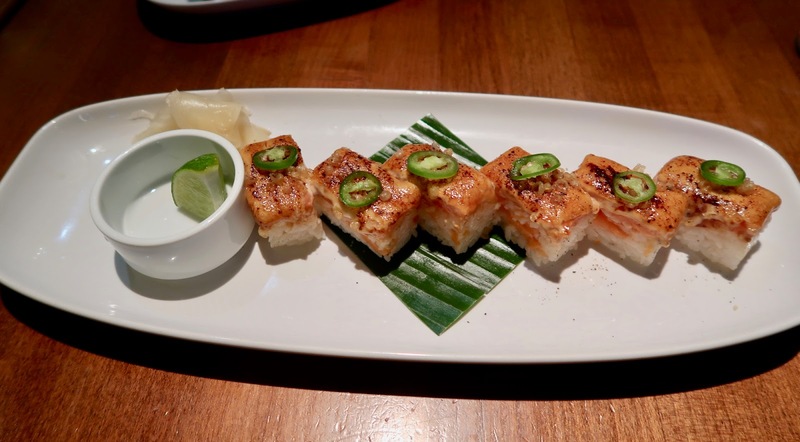 The last time I visited Victoria Sushi was in 2014, when they first started rolling out their Aburi offerings. Since then, the restaurant has become much busier, and the menu was expanded to include a full range of Aburi options. 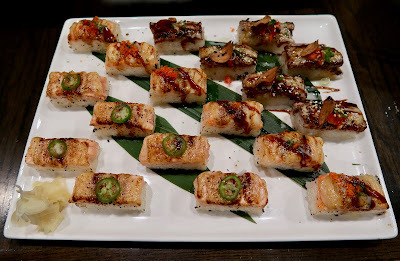 Victoria Sushi previously held the 4th place spot in my books for the best Aburi Salmon Oshi (behind Miku, Minami, and Green Leaf), and I was interested to see whether they had kept up the quality over the years. We started off with two simple rolls. We found the rice in the Salmon Roll rather sticky, and other than that, there was nothing particularly remarkable about the roll. 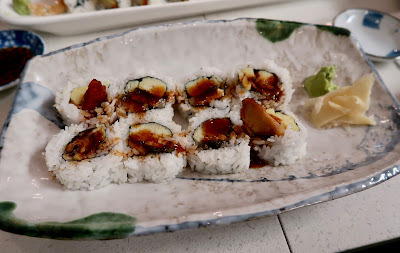 The Chicken Teriyaki Roll came with tender chicken, but would have benefited from a stronger grilled flavour. 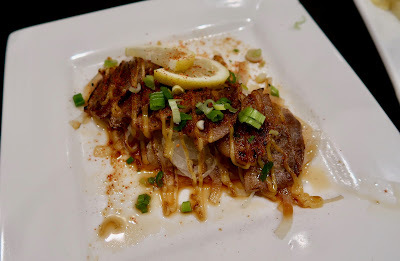 Going for something more adventurous, I selected the Soy Ginger Duck Miso Yaki. The duck was rather fatty, but was not as tender as we expected. The seasoning on the duck provided a slight spiciness, but it was hard to detect any miso flavour. Our three orders of oshi sushi came in a marvelous checkered display. The creamy oshi sauce on top of the Salmon Oshi and the Scallop Oshi was seared to create an excellent, well-rounded savoury flavour. 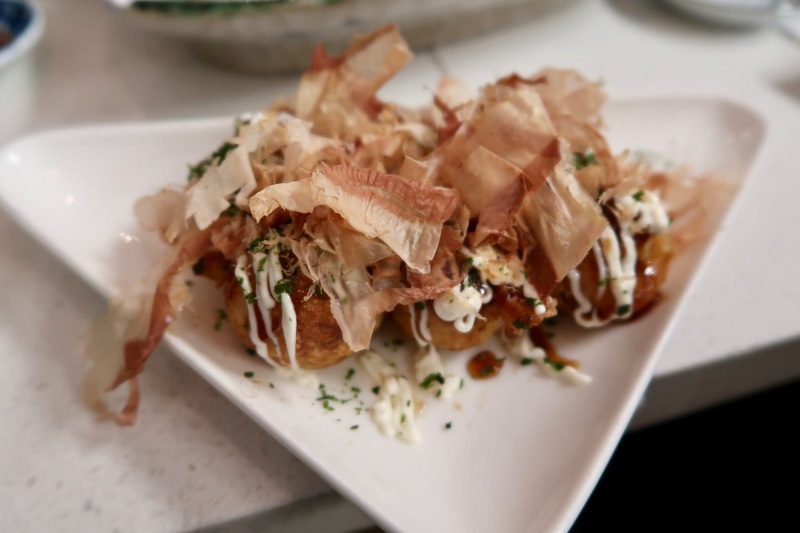 The Beef Oshi, made with AAA tenderloin beef, was topped with onion and garlic mayonnaise. 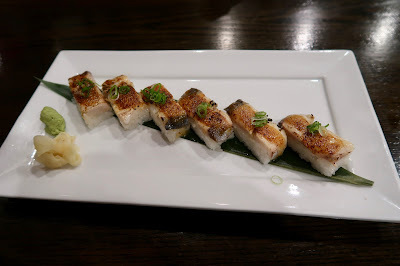 Overall, the toppings on each type of oshi were well-prepared, while the rice was overly sticky and too tightly packed. I later learned that we had come on an off day, as the rice issue was fixed on a subsequent visit. 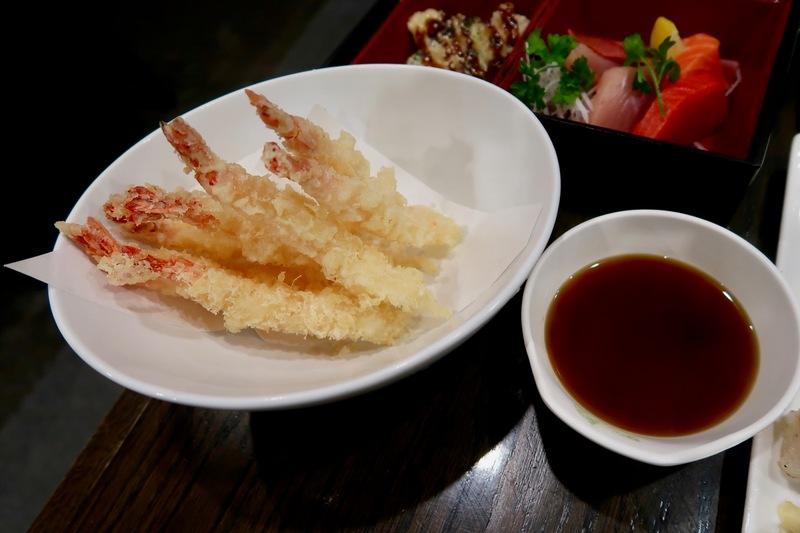 Due to the overly sticky rice, the Prawn Tempura ended up being the highlight of our dinner. The prawns were delicious, juicy and fried to just the right amount of crispiness. The amount of batter on the prawns was perfect. I would have gotten ten orders of this if I had the stomach room. 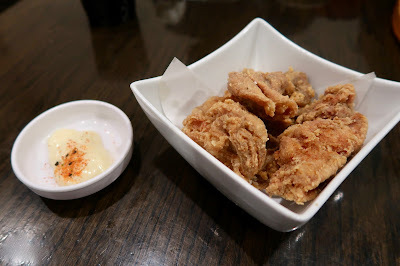 We were almost full at this point (we also had a Deluxe Bento, which I covered in Episode 39), but we decided to go for one last dish—the Chicken Karaage. It was pleasantly juicy and crispy, but could have been better with an additional sprinkling of spices. A few days after our dinner together, Sean went back to Victoria Sushi and reported to me that he would give the Shime-Saba Oshi an A+. 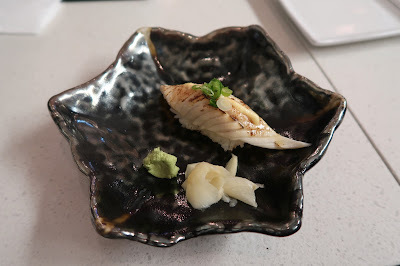 Since Sean almost never gives out A+'s for anything, that prompted me to return to the restaurant just to try the Shime-Saba Oshi (along with the fact that I had forgotten to take a picture of the restaurant). The oshi did not disappoint, and this time, the sushi rice was indeed packed correctly. The saba was savoury without being overly salty, and the soft texture of the saba was a perfect match for the rice underneath. Despite the restaurant being rather busy, we were not disappointed with the service. It was too bad we encountered minor rice problems with our oshi, but Victoria Sushi remains one of the top places for affordable oshi in my records. 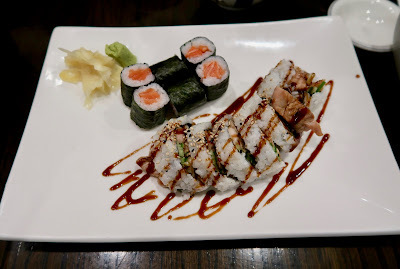 If Victoria Sushi was in a more convenient location, I would undoubtedly become a regular.